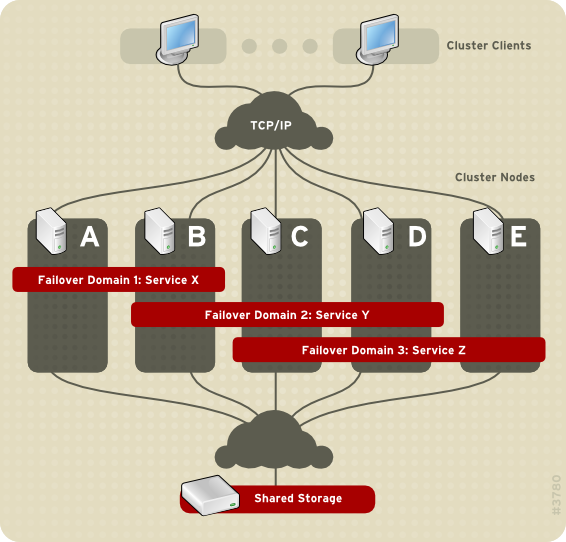 You can associate a cluster service with a failover domain. A failover domain is a subset of cluster nodes that are eligible to run a particular cluster service (refer to 図1.9「フェイルオーバードメイン」). In 図1.9「フェイルオーバードメイン」, Failover Domain 1 is configured to restrict failover within that domain; therefore, Cluster Service X can only fail over between Node A and Node B. Failover Domain 2 is also configured to restrict failover with its domain; additionally, it is configured for failover priority. Failover Domain 2 priority is configured with Node C as priority 1, Node B as priority 2, and Node D as priority 3. If Node C fails, Cluster Service Y fails over to Node B next. If it cannot fail over to Node B, it tries failing over to Node D. Failover Domain 3 is configured with no priority and no restrictions. If the node that Cluster Service Z is running on fails, Cluster Service Z tries failing over to one of the nodes in Failover Domain 3. 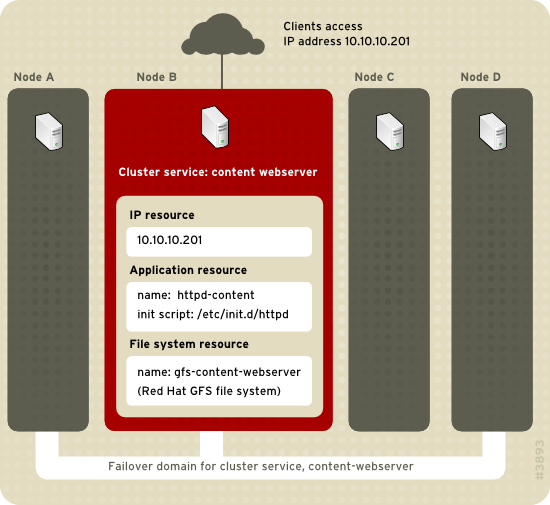 However, if none of those nodes is available, Cluster Service Z can fail over to any node in the cluster. IP アドレスリソース — IP アドレス 10.10.10.201.